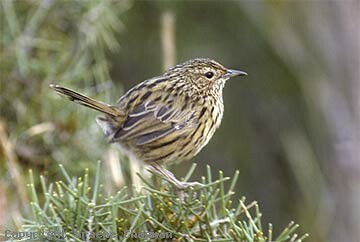 Striated Fieldwrens ( known often simply by their scientific name, Calamanthus) occur in coastal swampy heath country in southern and eastern Victoria and in NSW north to Tianjara near Nowra. Once adult, they occupy permanent territories in pairs, and after breeding small family groups. 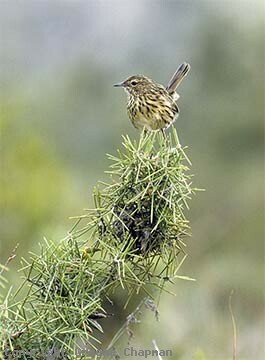 Fairly shy and difficult to observe, they are most obvious in spring when the males sing from vantage points, usually the tops of bushes. (see pics 500202 & 203). For most of the year they forage on or near the ground, hopping along in search of insects and seeds. They rarely fly more than a few metres at a time. 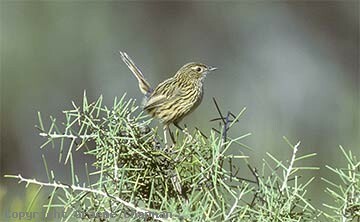 500201 ... Striated Fieldwren, Tianjara, N.S.W. 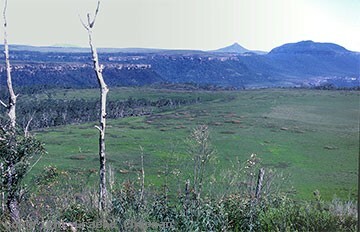 500204 ... Northern limit in eastern Australia - heathlands at Tianjara, west of Nowra.